This is not a recipe, so much as a guide-post, a half-map, half-reflection on the bounty of summer. One of my favorite things to make for dinner in the summer is a mash up of grilled veggies, with grilled bread and some cheese. If you get the chance to travel in Italy, most restaurants have a sort of 'bar' of grilled veggies -- eggplants, roasted peppers, zucchini, etc. -- all available as side dishes. But this time of year, with farmer's markets booming in Western Pa., I like to serve the grilled veggies as the main course. There are lots and lots of options for grilled vegetables and I've tried to grill everything but a cauliflower (although, now that I mention that ...) That said, certain veggies just scream to be grilled. Exhibit A: zucchini. And Exhibit B: eggplant. 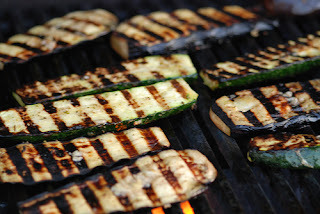 Maybe it's something about the squash family of vegetables, but I never eat eggplant unless it is grilled. Eggplants can get a little mushy and/or slimey, but toss them over a flame and they turn into silky, smokey goodness. The same is true for the humble zucchini and it's cousin, the yellow squash. I believe they are at their absolute best when cooked on a grill, nary a sautee pan in sight. In addition to the Brothers Squash, I like to grill up whatever my local farmers have on hand -- last month I had garlic scapes a number of times, but I believe their too short season is passed. Tomatoes are starting to come in and knobby onions are the bee's knees when grilled. If you've not grilled many vegetables, below are simple instructions. The great thing is that you don't need any fancy ingredients or a trip to a specialty store. Garlic oil is just that -- oil flavored with garlic. I generally keep a jar on hand by simply cleaning a couple of cloves of garlic and tossing them in some oil. After a couple of days, your garlic could ward off the entire cast of the Twilight movies, but even after a few hours the oil will have a garlicky-good taste. I like to do all of my prep and then head out to the back porch to grill. If you have any of the squashes (eggplant, yellow or zucchini), slice them into long, thin(ish) strips (as pictured above). For tomatoes, I core and quarter them. I slice sweet onions into fat rings. Lastly, get yourself some good bread, like bread from a bakery and cut it into thick slices. Go turn your grill on and get it good and hot. Your veg should sizzle when they hit the grill. Using a pastry brush (I use a small paint brush, but whatever ...), brush some garlic oil on all the veg (except the tomatoes -- I usually toss the tomatoes.) And grill away. Make sure to salt the veggies. I keep a container of salt at hand. It just makes life easier. I treat veggies the same way I treat meat, which is to say, I want to turn them once. Don't be afraid of a little char. Grill your tomatoes first and when you pull them off, put them in a bowl. Add some fresh basil and let those two flavors marry as you grill the rest of your bounty. If you're using eggplant, when you pull that off, brush lightly with some balsamic vinegar to get a proper Italian flavor. Grill the bread last making sure to brush that down with garlic oil, too. 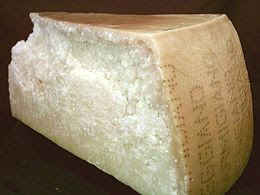 I like to serve the grilled feast with some goat cheese and manchego or a good hunk of parmigiano reggiano (only the good, imported stuff will due for this recipe.) Mangia!